We compared Waco to Lemoore. And yes, you get what you pay for. Yes, it’s easy for a pro surfer to call any wave pool “all time.” Pros make a living making shiite surf look good. It’s their job. But what about us capable surfers who know how to surf but don’t receive royalties for social media likes and contest results? How do we fare in the world’s best wave pools? This week WavePoolMag spoke with 40-year-old Ian Glover, aka Big Dog. Ian’s had the pleasure to surf both the Kelly Slater Surf Ranch and the BSR Surf Resort. He surfs a bit better than most of us but will be the first to admit he’s not a pro. What did he find out? Spoiler alert: Kelly’s sets the bar for surf and guest experience while BSR is a little chaotic and rough around the edges. And the heckling over the loudspeaker is a bit harsh. 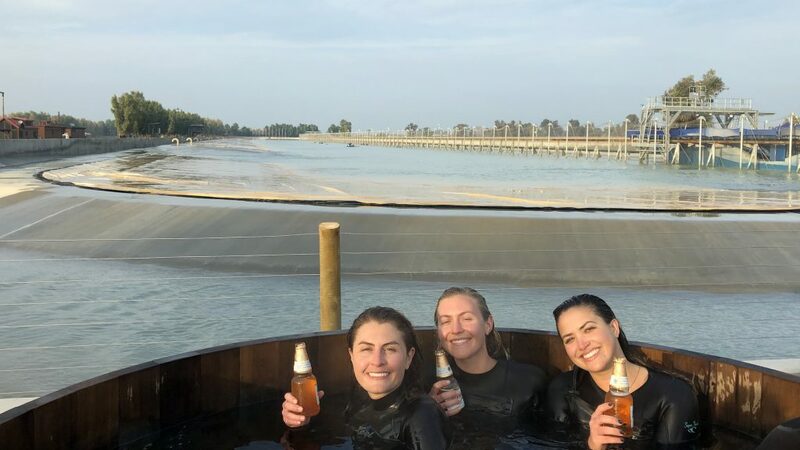 While our piece earlier this week explored the philosophical ramifications of Kelly’s wave pool through the cerebral cortex of William Finnegan this one is about access. In this interview we get the lowdown on cost, the waves themselves, what it’s like waiting between waves, how to get in, the overall atmosphere and whether you feel surfed out afterward. This autumn Big Dog got an invite from a group of friends pitching in to buy a day at the Kelly Slater Surf Ranch. For $32,000 off-season rate (peak season is $50K), surfers get 15 waves per hour during an 8-hour day to share. This means the glorious locomotive wave-maker will run along the tracks 120 times during your session. So for example, if you bring 16 surfers for an off-season day, that works out to $2,000 a surfer. Each one will get 7-to-8 priority waves. What’s a priority wave at Kelly’s pool? It means that the engineer throws out a wave just for you and no one else. That wave is all yours. If you fall, tough luck. However, there is always someone there near the fence to paddle into your missed opportunity. Since the wave at Kelly’s is so long, surfers can also agree to a first-half-second-half share strategy. 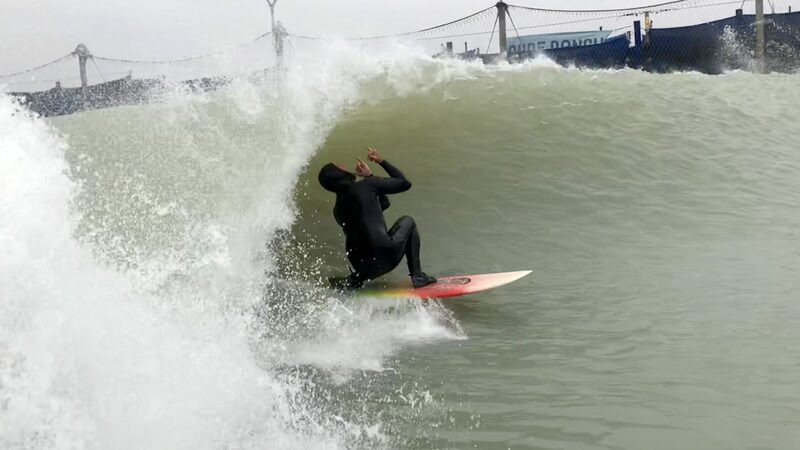 One person gets the first part of the wave and the other gets to drop in at the wave’s mid-point. A bonus for crafty Kelly’s surfers is to sit at the top end of the pool where the waves are first spawned. The wave dumps then peels for a bit before sectioning and closing out. The far shoulder of this part of the wave is where the priority wave starts to peel. If you’re fast you can get in a few maneuvers. The host services at KSWC (like beers in the hot tub) make the overall experience feel 5-Star, “like Tavarua” as Ian puts it. Despite the YouTube clips we see of perfect, peeling Kelly’s, it’s still a challenge to be in the right place. And how about the famous inside barrel section at Kelly’s wave pool – that reeling slice of magic that sets this pool apart from the others? Ian passed on the $2,000 buy-in offer from his friends but was lucky enough to score a pass through a “Friends and Family” day at the Surf Ranch. These are special promotional days for friends of the crew who work there: Lifeguards, engineers and the concierges. However, unlike a boatman on Tavarua, Ian said that working at a wave pool spitting out perfect waves, doesn’t guarantee you’ll get to surf. We see enough images of the world’s best at KSWC, but how does the wave pool rate among us everyday surfers? Once inside the walls of the Kelly Slater Surf Ranch, the stripped agri-business perfunctory of Central Valley California disappears. Ian says the staff is experts in the hospitality industry, and they go out of their way to make you feel comfortable. Did You Feel Surfed Out? Securing a session at Waco is more straightforward than at Kelly’s. The BSR Surf Resort is an addition to the BSR Cable Park and run on an established “turnstile” model. 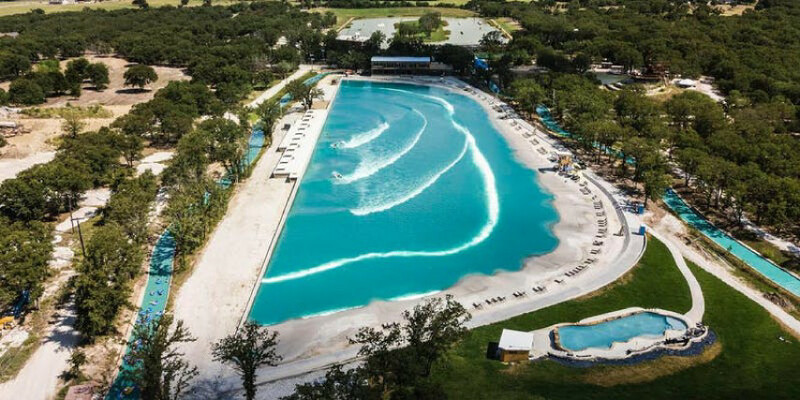 The owners had a greater paying public in mind when they built this wave pool. 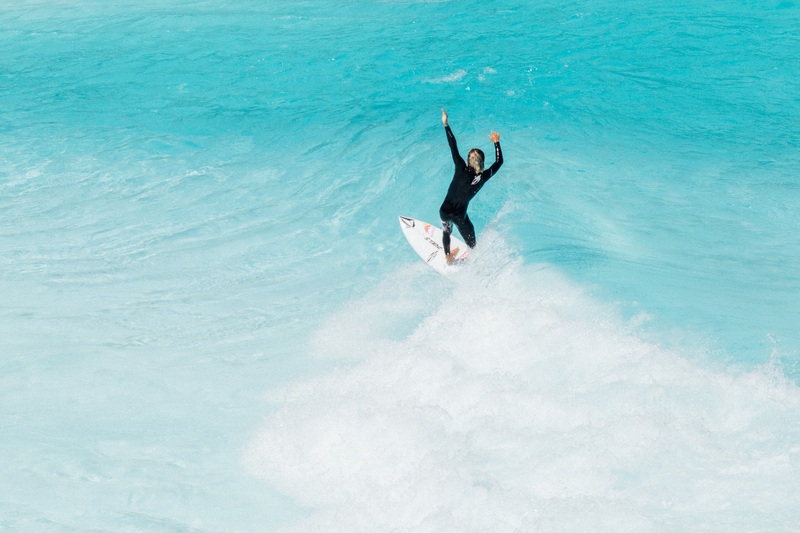 Surfers can sign on for $90 hour-long sessions (minus a few minutes for changeover). The American Wave Machines PerfectSwell technology pushes out 3-wave sets every 90 seconds. The park offers beginner hours at $60. Prices then increase after that capping at the $90 expert session rate. You can also rent the entire wave pool for $2500 an hour. There are between 120 and 160 waves per hour. Ian says he caught 12 waves during his hour. For Ian’s session, there were nine surfers during the hour, but not all those in the water were capable of handling the Expert Wave setting. With a football player’s build (6’4” and weighing 220) Ian struggled to find a good push from the wave at BSR. Since opening BSR Surf Resort has been booked solid. When new weekend slots are posted at midnight the week prior, they’re snapped up pretty quick. Ian says that Waco’s atmosphere wasn’t nearly as guest-focused as Kelly’s. The scene is a bit “chaotic” according to Big Dog, Guests are addressed over the loudspeaker if their lack of ability is hampering everyone else’s session. Not everyone likes to be told to move out of the way after missing a wave. Some guests take issue with this. So, if you can afford $250 per wave, value top-shelf customer service and guest experience and can be a little creative to expand your wave count, then choose Kelly’s. The wave pool is the Tavarua of freshwater surf trips. If you’re looking for regular sessions in the environs of Waco, hone your online booking game and reserve your session at BSR. While (way) more affordable than Kelly’s, the ambiance reflects the no-nonsense price. You don’t get 5-star hotels at 2-star hotel prices. You also have to put up with heckling from the announcers. In conclusion, before booking you need to know what you’re looking for. While Kelly’s is similar to an exotic Mentawai trip, Waco is more like scoring a great day at your local beach break – parking lot vibe and all.